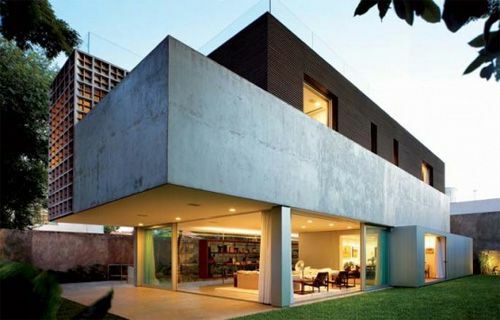 MMBB Arquitetos designed the imposing Boaçava House, a concrete residence located in São Paulo, Brazil. Here is the official project description from the architect: Supported by 4 columns only, the house rises up from the ground, liberating the land for several outdoor applications for leisure and services. The 4 columns support 2 reinforced concrete parallel bearing walls. They are the building superstructure and are also reinforced by the transversal slabs. All technical installations are juxtaposed to the side-walls, forming the house infrastructure. All “fixed” parts have been grouped on the volume periphery. The space in between the bearing walls and the slabs shelters the other functions that are organized according to the plan’s flexible layouts. This is a response to the inevitable transformation that this residence has undergone over time. A central court articulates all spaces, integrating them both visually and functionally through its multiple transparencies assured by emptiness and glass surfaces. Under the living room slab, in the semi-basement, sits the laundry room and garage areas.” How do you appreciate the design of this residence? Do you find its design appealing?